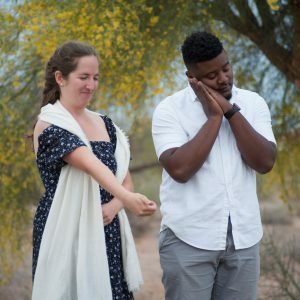 In the city of Apache Junction, at the foothills of the Superstition Mountains, graduate students from Arizona State University performed a series of theatrical scenes related to the city’s history. This event, called “Positively Ghostly,” brought to life tales of ghosts and lost treasures gathered from local residents, and illustrated the Old West history ingrained in the city. These performances allowed residents to connect with local legends and landscapes while reflecting on the value that their city brings to Arizona. “Positively Ghostly” was a collaboration between the city of Apache Junction, ASU School of Sustainability students involved in Project Cities, and ASU Herberger Institute for Design and the Arts students. The event was part of a wider tourism project called “Positively Apache Junction” led by Project Cities, a university-community initiative within ASU's Sustainable Cities Network.